Team Fullbright is happy to announce that John will be playing two extra-big, extra-special shows in Oklahoma in December: UCO Mitchell Hall in Edmond on Dec. 12, and the Cain’s Ballroom in Tulsa on Dec. 19. Tickets for both shows go on sale at 10 AM on Friday, Sept. 4. This will be the third show for John at Mitchell Hall, including the album release show for “Songs” last year, and the second headlining show at the Cain’s, following the very successful opener for Woody Guthrie Center’s second anniversary celebration this past April. Mitchell Hall boasts a beautiful auditorium, great acoustics, and reserved seating. 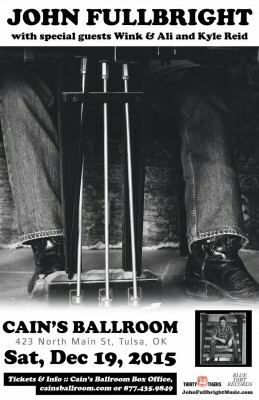 The Cain’s, of course, is a historic Oklahoma venue that has been host to… everyone. No, really. Both shows will include John and the full band. The Mitchell Hall show will include Buffalo Rogers opening, and Wink Burcham, Ali Harter, and Kyle Reid will join John at the Cain’s. These are going to be great shows — don’t miss ’em! With Buffalo Rogers opening. Tickets on sale Friday, Sept. 4 at 10 am. With Wink Burcham, Ali Harter, and Kyle Reid. Tickets on sale Friday, Sept. 4, 10 am.